American President Theodore Roosevelt named because Roosevelt’s nickname is Teddy and he likes hunting. The name of the teddy bear is said to have originated from a rookie in Missouri in 1902. The assistant found and caught a Louisiana black bear, the assistant wanted to kill it, and Roosevelt refused to kill the trapped bear and criticized the assistant as “unsportsmanlike”. Then a political cartoonist quickly published the comic “Teddy&apos;s Bear.” The first comic appeared on the second day, November 6. Clifford K. Berryman, a comic editor for the Washington Post, recorded the incident in the form of a front-page comic. Berryman painted the bear sitting on the ground, Roosevelt with a gun, his back to the bear, and a gesture of refusing to kill the prey. At the bottom of the picture is the drawing “Drawing the Line in Mississippi”, which links hunting anecdotes to political controversy. The simplest way to distinguish a teddy bear is to look at the workmanship. The rough workmanship is definitely a counterfeit good. The genuine touch is very soft and comfortable. A good brand of Teddy’s heads can be moved ~ hand-built ~ that is, five joints can move. High-end brands: the world-famous teddy bear brand, such as the German teddy bear giants, Hermann Spielwaren, Steiff Clemens. There are also Grisly from Germany, Martin, Merrythought in the UK, and R.John Wright in the US (good at styling teddy bears). Middle and low-end brands: American ty, Boyds, Gund, Canada Ganz Korea AURORA and so on. Of course, the more expensive the price, the better. After all, a penny is worth the goods. The bear fabric is high-grade Angora wool and South American alpaca, and the bear’s eyes are hand-made glass eyes from the city of Lauschaer, Germany. There is now a trend to use plastic eyes, which are also called safe eyes because they are not easily broken. Whether it is glass or plastic, the bear’s eyes are covered with hazelnuts. The inner filling is wool, wood shavings, and the like. The fabrics of ordinary bears are made of artificial wool. At present, the quality of artificial wool in Korea is very good and the price is not expensive. The inner filling is fluffy cotton or the like. The bear’s eyes are plastic eyes, usually without hazelnuts. Good bears have joints, and the joints of the head and limbs are fitted with plastic joints or paper joints, which can be rotated 360 degrees. Ordinary bears do not have joints, but the trend now is that ordinary bears are also made with joints. Therefore, we can say that the joints are not necessarily good bears, but the good bears must have joints. Good bears are handmade art, and ordinary bears are industrial products made by machines. Like other industrial products such as automobiles, teddy bears manufactured in factories in Europe and the United States are better than those made in China. Because China’s labor is cheap, more than half of the world’s teddy bears are produced in China and then exported abroad. Products exported to Europe are better than those exported to the United States because the quality standards for safety in Europe are higher than those in the United States. Products exported to Europe are marked with the CE mark. At the very least, a good bear should be licensed, with a foreign company’s brand agent authorization certificate, import declaration certificate, factory certificate, quality inspection certificate, etc. The place of sale is in a formal large-scale shopping mall and a monopoly store or a regular online store. 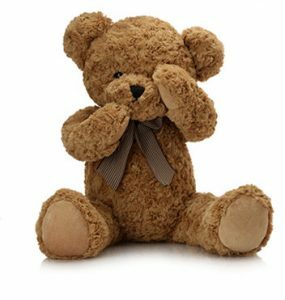 The second bear refers to fake, fake, fake, and inferior products, such as fake goods, tail goods, goods, etc., commonly found in low-end toy wholesale markets, roadside small toy stores, and informal teddy bear monopoly online stores. The teddy bear, which needs to be sterilized, can be placed in a sealed plastic bag and placed in the freezer of the refrigerator for 24 hours. Note that this method does not apply to classical slings filled with wood chips and foam. In order to make the teddy bear look clean and easy to collect, moderate sun exposure can also prevent raging and dampness, and it can improve the sounding device’s audible and unvoiced sound due to long-term humidity. It is a simple and easy method for dehumidification. When the teddy bear is damaged, it can be sent to the original factory for repair, but only the teddy bear manufactured by the agent or the famous factory can enjoy such service. If the damage is not serious, you can find the sutures of similar colors to repair them yourself. There are also special bear hospitals abroad to deal with these “disabled” bears, but unfortunately, there is no such “medical” institution in China. Replacing fur for teddy bears is usually suitable for older antique teddy bears. Teddy bears with severely damaged furs should first communicate with the operator before changing the fur, and provide detailed information on the prototype of the bear, such as pictures. Otherwise, the bear after the “beauty skinning” may not be the one you used to know. Teddy bears, and its value will be greatly discounted due to improper replacement, or become worthless. Both rubber and elastic are used for fixing because of their high elasticity and flexibility. However, such materials lose shrinkage due to prolonged pulling. Therefore, it must be taken down from time to time and allowed to return to its original tightness, which will be more durable and less flexible. The lens cover must also be taken down and washed frequently. Since the surface of the material cannot be rubbed or rubbed, it can be diluted with hot water in a small amount of vinegar or soaked with bleach bleached with special bleached clothing. At the same time, the eye mask that has been soaked in hot water is also less prone to aging and hardening. This method can also remove dirt and old stains that are difficult to clean around the glasses. If the eyeglass cover and elastic band are no longer usable, you can buy a replacement elastic band at a store that specializes in handicrafts. If you are lucky, you can even find a special doll eyeglass replacement, but the price will be more expensive and the style will be more single. You can also go to a sports goods store or buy child-specific swimming goggles as a substitute. Choosing the right one can have unexpected effects. Wash the teddy bear’s clothes, basically use a cold wash to gently rub, you can add clothing softener to remove the static electricity of the fabric, making the clothes softer. When cleaning, be careful not to use bleach because of stains, or use a brush to scrub. Since the texture of the Teddy bear clothes is basically elastic, it is particularly difficult to pull vigorously, otherwise, the clothes are prone to looseness and deformation. If you are afraid of trouble, you can send a dry cleaner to let the professionals handle it for you.